With the first low developing in the Coral Sea it is a good time to enact your cyclone preparedness plans. Your disaster bin should be located in an area that is readily accessible and should have a list, kept with the bin, stating what the contents are. It is important to replace things like batteries and review its contents on a regular basis. For more information about cyclone and disasters preparation, visit some of the Museum Development Officer previous blog posts or contact us. The MDO program recently received a Gallery and Museum Achievement Award (gamaa), presented by Museum and Gallery Services Queensland, for their flood relief work. The award was given in the category of Organisations: staff of 4 or more. Please see below for the project summary and the judges citation. In early 2013, floods devastated regions of Queensland, in particular around the Wide Bay/Burnett area. The MDOs converged to provide a professional, first-response disaster service to museum communities in Gayndah and Bundaberg. The MDOs worked with volunteers and staff at each location to ensure that any major decisions regarding the damaged collections were made jointly. Conscious not to use emergency resources or facilities needed for those who had endured significant loss, the MDOs brought mobile accommodation to deliver conservation and museum disaster procedures on-site, which allowed for limited but practical training to be undertaken. Being on-site also provided professional and emotional support through reassurance that community collections could be rebuilt, and that response efforts were supported. The MDO Blog played an important role in the dispersal of information and informed peers and the general public of the work being undertaken. The MDOs developed a professional relationship with these organisations based on mutual respect and understanding. 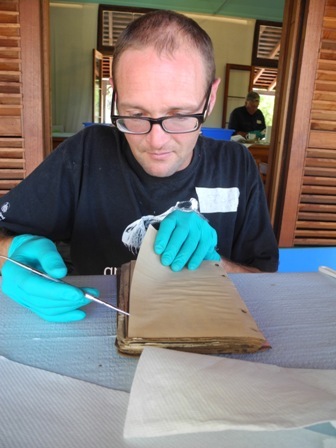 They returned to Gayndah in October where they assisted in the conservation of the paper and photographic material that had been frozen immediately after the flood event. The MDOs were able to train the volunteers, thus allowing them to complete the process of first response action right through to reinstating the collection and its ongoing management. 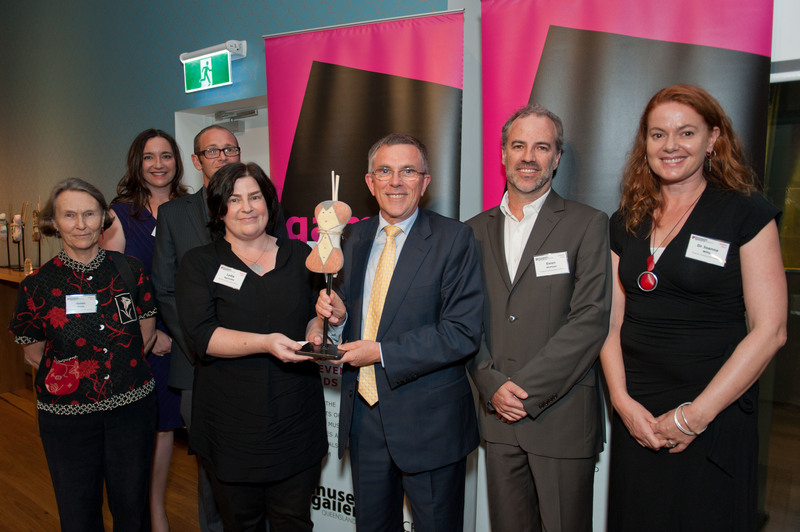 In choosing the 2013 Queensland Museum MDO Flood Response as the Winner in this category, the judges acknowledged the Museum Development Officer Program’s outstanding leadership in harnessing their training and knowledge to provide front-line support to communities in recovery. Their demonstration of best practice, and the creation of a learning environment for all involved (including themselves), resulted in a streamlined approach to the care and safeguard of collections at risk. The judges also recognised not only the professional support provided to these organisations by the MDOs, but also the personal commitment – living in campervans and working side by side with affected volunteers and staff in the midst of mud, water, mould and debris. For a full list of other gamaa winners please see the Museum and Gallery Services Queensland website here. In February 2013 communities in the Bundaberg, Burnett and Frazer Coast region were inundated by flood waters in the wake of ex tropical cyclone Oswald. 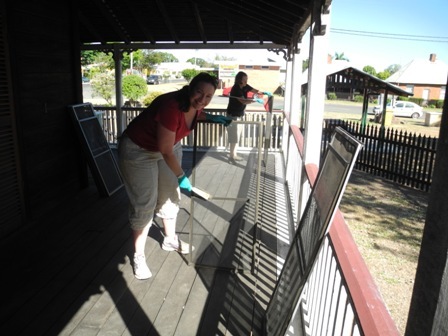 In an initial disaster response, Queensland Museum’s MDO team worked with museums at Gayndah, Bundaberg and Maryborough to salvage collection material, and provided assistance to museums faced with the massive clean up task. Eight months later, five MDOs, and Queensland Museum’s Director of Regional Services, Deborah Bailey, returned to Gayndah to help volunteers deal with the next phase of disaster recovery. The three day trip was also a chance for the MDOs and volunteers to get some invaluable applied onsite training. Earlier posts on the blog outline the process for freezing paper-based materials. Frozen material can be dealt with later, at a more convenient time for people whose lives have been disrupted by a disaster. 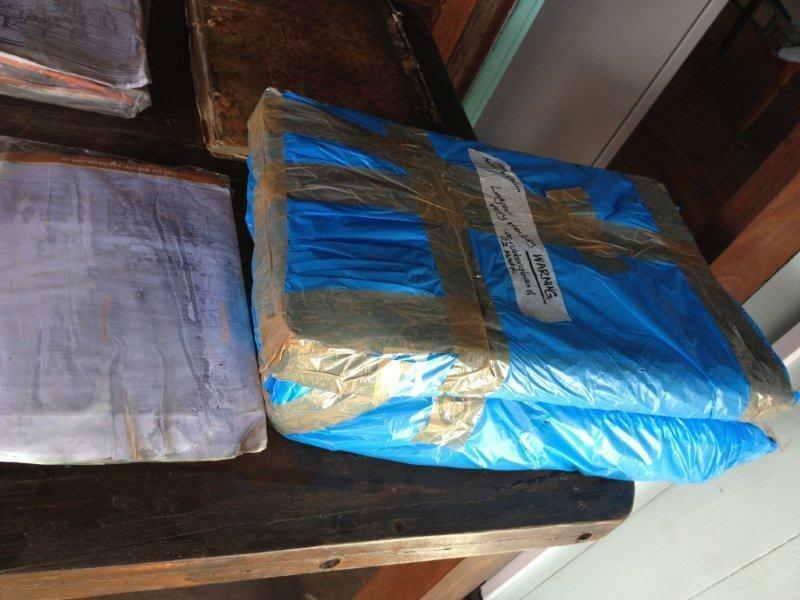 Packages of frozen documents defrosting from Gayndah and District Historical Society. (Photo: Lydia Egunnike). To prepare for the unfreezing process, Gayndah and District Historical Society volunteers removed the wrapped packages from the freezer two days before the MDOs arrived. They wrapped them in towels and placed them in an undercover, shaded area to slowly defrost. 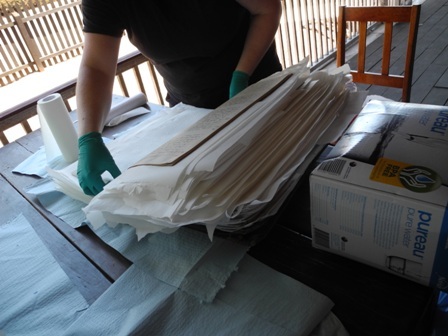 Lydia Egunnike, MDO for the southern inland region, organised all materials needed for the workshop, including vast quantities of paper towels, plastic spatulas and clean water. John Wein, the Secretary of the Historical Society, ensured there were plenty of fly screens on hand that could be used for drying racks, bricks to make tables higher and prevent sore backs, and food for a hungry work crew! Activities on the first morning involved setting up works stations and drying stations both inside and on the museum verandah. Deborah Bailey and Helen Pithie ensure fly screens used for drying stations are free of dirt. (Photo: Ewen McPhee). 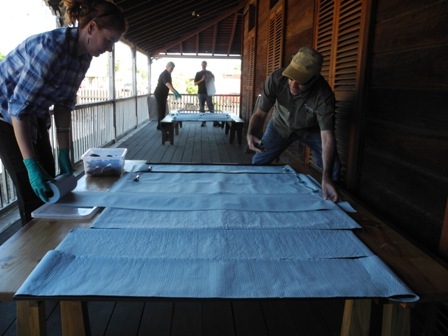 Jo Wills and Ewen McPhee cover fly screens with absorbent material to make a drying station. (Photo: Helen Pithie). Lydia then provided preliminary training on how to carefully separate documents, what to do if they were stuck together, how to clean away residual dirt and mud, and how to start drying them properly. Lydia Egunnike demonstrates how to separate and clean defrosted items rescued from the floods. (Photos: Helen Pithie). Each MDO and the six volunteers (John Wein, Mary McIntyre, Brian and Sue Hutchinson, Jamie Wilson and Judith Woodman-Heuth) then set about working through the bundle of frozen documents. With John providing advice about which documents or materials they could discard, much time was saved. John also started the process of scanning dried documents that contained important information but which were not going to be kept due to damage, mould and/or general condition. Drying booklets, folders and archives was a primary goal. Items were interleaved with paper toweling, often two or three times over the course of the site visit. 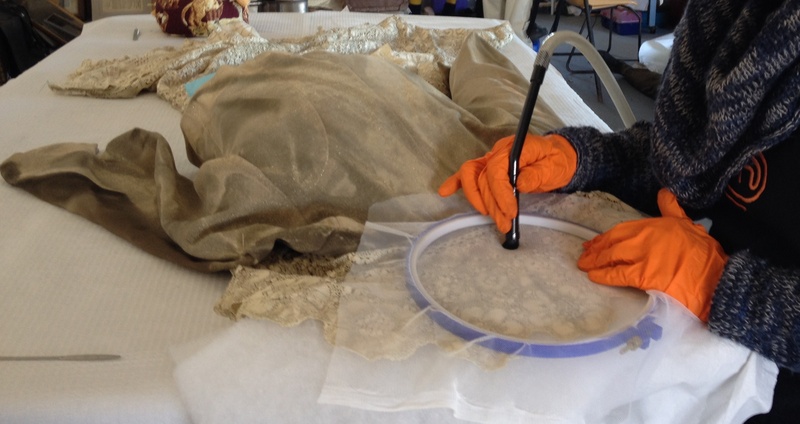 Some material was stuck together so tightly it needed to be re-submerged in clean water or re-wet and gently prised apart using finer, more professional conservation tools. Josh Tarrant separating the pages of a manual. (Photo: Helen Pithie). Helen Pithe at work table. (Photo: Ewen McPhee). 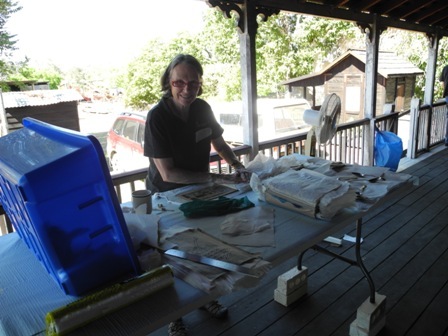 Interleaving a ledger with paper towels to help the drying process. (Photo: Helen Pithie). At the end of the three days, all frozen items had been assessed with the drying process underway. This was possible because of the large number of volunteers and MDOs available, but also due to the organisation and planning that had gone into preparing for the activity. Many thanks again to the Historical Society at Gayndah volunteers for making the MDO team feel welcome and keeping us well fed.